Now, through the wonders of hypertext, you can visit some of the places that, for better or worse, have made an impression on me. For 22 years, I called the Delaware Valley my home. The last of those years was spent working for the American Association for Cancer Research. Someone with a lot of time on his hands has created a page devoted to my hometown, Berwyn, Pa. Visitors to Berwyn will no doubt want to visit my old high school and my junior high (now a "middle school"). For some insight into my formative years in the Philly suburbs, take a look at the Selected Poems section of The Jim Archives. 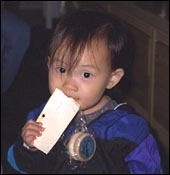 My niece Anna in 1996. That big city at the end of the Jersey Turnpike has become a regular stop on my eastern swings, now that my brother's family has settled on the bucolic shores of Roosevelt Island. I now have two nieces, Anna and Kayla, and a nephew, Michael. My brother works for the Fox News Channel, which claims it is less biased than CNN. However, they seem to interview a suspiciously large number of Republicans. Tourist tip: The tram ride between Roosevelt Island and Manhattan belongs on any list of cheap New York thrills. In 1992, I left kith and kin back East to start life anew as a grad student at UC-Berkeley. Life in Cal's English Department had its ups and downs. Enough downs, in fact, to make me leave the doctoral program. But I did finish my master's thesis.